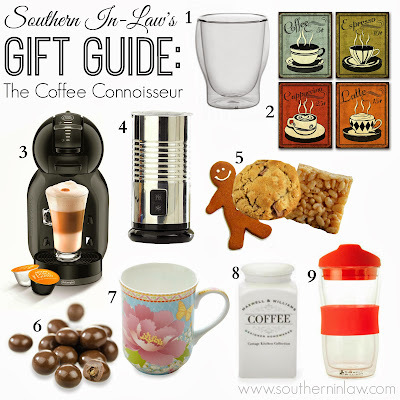 If you have a coffee lover in your life, here are some gift ideas they may love this Christmas! They range from super cheap to a little bit pricey so you can choose the gift to suit your budget! Every gift has been tried and tested by us, so you can be sure they'll be perfect! Find out all the info and where to buy them below! And in the latest news - this girl can now drink coffee! I've always been incredibly sensitive, however, now I can sip away! Thank you, healing stomach! I love these Retro Coffee Prints from Skillful Synergy on Etsy ($20.00 for a 4 pack) and they'd make the perfect edition to most kitchens. The perfect present for a frothy coffee fan - and it makes making coffee for friends a little bit more impressive. The Bellini Milk Frother from Target is fantastic and just $25! What better accompaniment for coffee than some homemade treats? I love filling cute coffee mugs (try this Christmas Tweets Coffee Mug for something festive at just $7.95) or biscuit tins with homemade goodies for family and friends. Try easy to store and easy to make recipes like our Healthy Gingerbread Recipe, Healthy Peanut Butter Rice Crispy Treats, Healthy Chocolate Peanut Butter Rice Crispy Treats, Honey Almond Butter Rice Crispy Treats, Healthy Oatmeal Chocolate Chip Cookies - or even some raw bites! A great stocking filler for a coffee lover. Our local coffee shops have chocolate covered coffee beans available for sale and I know you can also buy them at chocolate shops and coffee chains like Gloria Jeans and Starbucks. You can never have too many cute coffee mugs - and this Maxwell Williams Enchante Jacqueline Jolie Mug is a great stocking stuffer at just $9.95 per mug! They come in a variety of different colours, patterns and designs. Whether it's coffee beans, pods or grinds this 1 litre Maxwell & Williams Coffee Canister from Kitchenware Direct is perfect for a coffee lover and only $9.95! It has an airtight seal so you can be sure their coffee will stay fresh. I love this Maxwell & Williams Twin Wall Straight Mug from Kitchenware Direct. It's perfect for hot or cold drinks (and doesn't get too hot on the outside) and is only $14.95! But tell me, are you a coffee fan? How do you take your coffee - and what's on your Christmas list?